Plan plenty of football party game ideas. 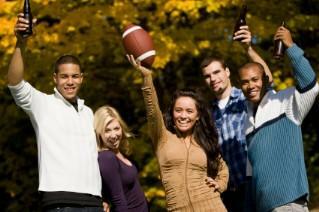 Use football party ideas to kick off the season with family and friends. Alternatively, it could be a perfect birthday party theme idea for both children and adults who love the sport. Whatever the reason for the celebration, a football theme is a winning choice. The best way to spread the word about your upcoming football party is to send out party invitations. Do this using online invitations, free printable party invitations or using themed invites that match the rest of your decorations. If you are hosting a large block party, consider mailing and posting printable party flyers around the neighborhood. Make note on the invitation if the party is for viewing a specific game, and whether the guests should come dressed in their team colors. This is a fun way to liven up the party and let guests know who is rooting for which team. Get some "defense"-ive decorations for your football themed party. The decorations can be as simple as tableware and streamers in team colors, or as extravagant as hunting down life-size cutouts of your favorite players. Look for team-specific party decorations at the local team's gift shop, especially if you are rooting for a university team and need college football party supplies. If the day is less about a specific team or game, put out décor that reflects football in general. Using decorations that are not team specific make them more economical, especially if you have several different team fans in the house. Check out party supply stores like Sports Party World for decorations. Your party will be sidelined if you don't have the right types of food. Traditional game day fare often includes beer or soda, pizza and chips. However, putting a little overtime into the game day spread will really create a fantastic atmosphere. Another great game-day idea is to make the party "potluck." This works especially well when the party is an open house. People arrive with a side dish or dessert for all to share, while the host provides table service, the main dish and drinks. A potluck guarantees some delicious dishes while providing variety for all who attend. Fan Face Painting: Get everyone's game face on with some pre-game face painting in team colors. Use temporary tattoos if you think face painting may get too messy. Football Card Craft: Children love to trade sports cards, so help them create their own. Upon arrival, take a quick digital photo of each child wearing a football helmet. Print off wallet sized photographs for each kid, and then let kids create their own "stats" on the back. Make enough copies so each child can hand them out to everyone else at the party. Tire Toss: Hang an old tire from a branch outside. Have everyone take turns at tossing the pigskin through the center of the tire. If both adults and children are at the party, separate them into two groups to make things fair. Football Drills: Lead rambunctious youngsters in a modified version of Simon Says. Instead, have the leader be the referee, and lead everyone through traditional drills. Jumping jacks, push-ups, sprints and more are fun for kids to do outdoors. Penalty Pass: Hand everyone a mini soft football. Choose a certain word or phrase that cannot be said during the game. If someone does say it and another person notices, he or she has to pass his/her football to the person who said it. At the end of the game, the person with the most footballs is "benched" (the loser). Have a gag prize ready. Guess the MVP: At the start of the game, have everyone write down who she or he thinks the game's MVP will be. Whoever guessed correctly will win a small prize. For a tiebreaker, have a few football trivia questions ready. Remember to send everyone home with a memorable party favor. Look for football party ideas for favors in the stands-think of football beads, plastic mugs, clackers, or even pompoms.